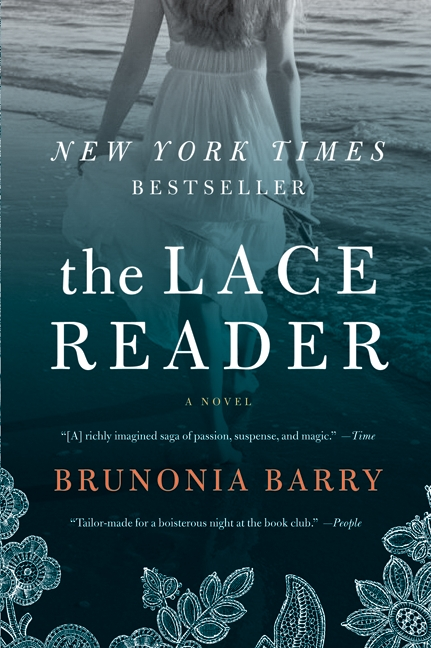 Brunonia Barry’s The Lace Reader, a delicately crafted mystery about generations of women in Salem, Massachusetts, is deceptively light, yet intricately patterned, much like lace itself. A mesmerizing first novel, it casts a powerful spell with its involving exploration of memory, misogyny and magic. Like all the women in her family, Towner Whitney can read the past, present and future in patterns of lace, particularly in the Ipswich lace handmade by the ladies of Salem using centuries-old methods. It’s a curse as much as a gift, with a disturbing vision catalyzing her departure from Salem 15 years previously. She returns home when her beloved great-aunt disappears, an event that forces her to confront her fractured and forgotten past, and discover what really happened to her twin sister all those years ago. The Lace Reader reads like a dream, with misleadingly simple prose. While a sense of melancholy pervades and many dark subjects are addressed – loss, abuse – it’s also often funny, with an appropriate touch of wit breaking through like sunshine though heavy clouds. Although the tale is full of magic and witches, it’s the kind that exists in real life, the kind that is part of modern Salem life, both for the benefit of tourists – tarot readings, historical recreations – and as an expression of the characters’ beliefs and insight. Lace reading is heightened intuition – Towner remarks that everyone has a capacity for it – and seemingly fantastic events – disappearing acts, hauntings – are plausibly explained. Barry also sees and reveals the magic in reality, such as a “sparkling trail” of phosphorescence that follows a pair of lovers as they swim, which adds a fairytale quality. As one might expect from a novel revolving around crafts – witchcraft and handicraft – women dominate the narrative. Most of the women are damaged in some way, victims of the men in their lives, much like the persecuted Salem “witches” of the past. Yet many are also strong, channelling their power through creativity and solidarity. The main women in Towner’s life are warriors in their own way. Her mother May, though a hermit on her own island, rescues battered women and facilitates their completely self-reliant lifestyle – they grow and pick their own food, and even make the flax for their lace. Great-aunt Eva is a Salem institution, able to pull strings to help others, and acting as a guide in both etiquette and matters of the heart. Though she disappears at the very beginning, she retains a strong presence throughout, guiding Towner and the reader towards the truth. Lyndley, Towner’s long-deceased twin, recalled in flashbacks, is vivacious despite her difficult home life. Ann Chase, the most famous witch in Salem, is witty and supportive, a source of occasional refuge for Towner as she readjusts to her return. Angela Rickey, a waif who also disappears, acts a thread that reconnects the women, demonstrating the way history inevitable repeats itself when patterns are kept intact. While misogyny is explored – especially through the figure of Cal Boynton, a charismatic cult leader who has cast a dark shadow on the Whitney women’s lives – the men also receive nuanced characterization. Detective John Rafferty, a transplanted New Yorker who has been assigned to the case of Eva’s disappearance is compassionate and curious. Beezer, Towner’s brother, has his own ways of dealing with their shared history and displays constant concern for his family. Jack LaLibertie, Towner’s first love, is both Prince Charming and pathetic, as trapped by past events as she is. Towner herself is elusive, unsure of her past and – like the author – has a gift for writing that allows her to embroider her history, mending the many holes with her active imagination. The reader can never be sure of her interpretation of events – and neither can she. This tale’s mystery and complexity is deepened by the layered narrative, which comprises Towner’s unreliable narration, Rafferty’s third-person perspective, police reports and excerpts of Towner’s journal and Eva’s The Lace Reader’s Guide. Clues and revelations are artfully hidden throughout – the reader is invited to play both detective and lace reader, gazing into the story’s patterns to find the truth. Once the bigger picture becomes clear, you’ll want to re-read again and again – and will likely be able to see something different each time. The lace motif is effectively exploited, working as metaphor, plot device and clue. Towner receives a piece of lace before she returns to Salem, which acts as a net to draw her back into her past. She clears all the lace from Eva’s home as if they were cobwebs. The Ipswich lace is often described as imperfect and flawed – yet beautiful – like Towner and May’s girls who have revived the tradition. The lace, particularly through Eva’s guide, also serves as a unique lens through which to view Salem’s long history, hinting at the hardships the colonial women endured and the creative ways they adapted – another reflection of female power, specifically the power of the Whitney women. This historical background adds to the strong sense of setting. Barry vividly evokes Salem and its small town life, depicting the continuation between its troubled past and touristy present, which later emphasizes the terror of a modern-day witch hunt towards the novel’s climax. Salem and its islands are stunning, but full of dangers, from minor ones like rabbit holes to inescapable ones like abusive fathers. It’s an effective backdrop for Towner’s memories of her alternately idyllic and horrific childhood and adolescence. Thanks to Barry’s deft handling of difficult subject matter, The Lace Reader ultimately succeeds in delivering a hopeful message. By unravelling a destructive, complicated pattern, it ends with a kind of freedom for its heroine. The first thing you’ll want to do when you’re done is read it again. I’d like to read this book, I love escaping into these kind of books. Maybe I shall order it on Amazon today! I'm a freelance writer based in the UK. I enjoy reviewing films and books, writing about entertainment and culture, and profiling personalities, with a focus on Southeast Asia. Post-colonialism, expatriates, human rights and international development are other issues that I'd love to write more about, reflecting my upbringing around the world, BA and MA studies and work experience. I'm always up for breaking out of my comfort zone, so if you'd like to set me a new challenge, email me at labrujitarosa (at) gmail (dot) com.